Giving in to Gift is looking to commission four new sound works, each made to be listened to in a specific situation, for free distribution online. Liverpool's creative developement agency ACME are launching the brand new network in September. OK it has the same name as the old Liverpool network but we are promised something brand new and a bit more function than the old site, as it has been built from the ground up by Design Agency Splinter. I should know I helped with the user testing, so I hope they took my advice. Yes, ACME has been busy reinventing this unique site that promotes Liverpool's creative community, and it will soon be ready for creatives to update their profile and portfolio, and re-connect with others and with your Facebook, Twitter or LinkedIn accounts. You like Jam right! 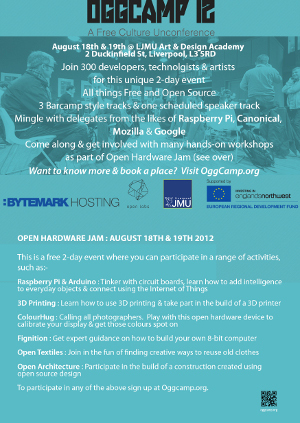 Well, do you like Raspberry Pie sorry Raspberry Pi - if you know what Raspberry Pi is then this event coming up in August is just for you. It's all part of OggCamp - the free culture Unconference which will see 300 developers, technologists & artists gather for this unique event that celebrates all things Free and Open Source.